Ever since I relocated to Costa Rica last September, friends have asked: So what are you doing down there? Tomorrow, Jan. 15, you’ll see exactly what I’ve been doing—what my colleagues and I have been working toward for the past 11 months. 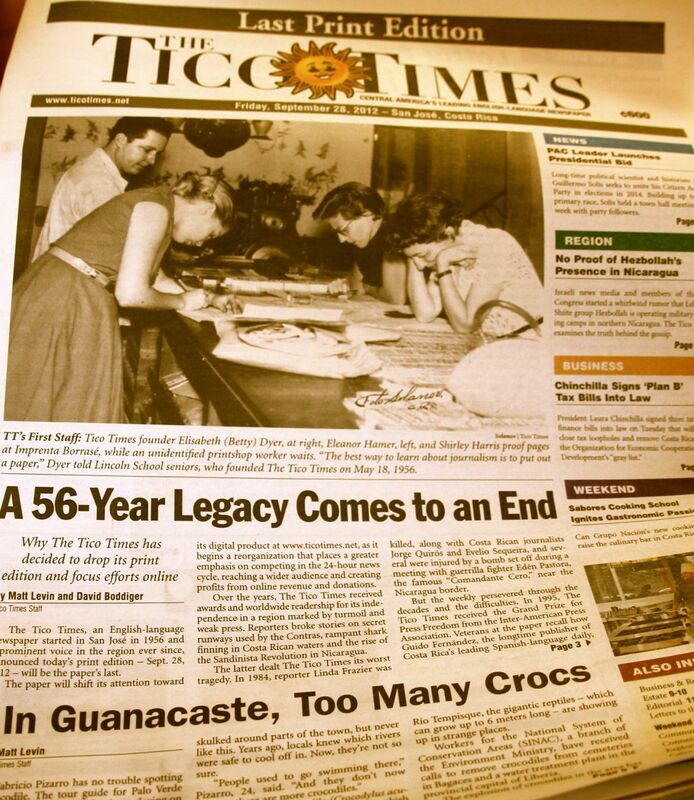 The Tico Times was founded in 1956, and today it is widely considered the most important English-language newspaper in Central America. On the streets of San José, people recognize the Times immediately, whether or not they speak a lick of English. The weekly used to hit newsstands every Friday morning, but in 2012 the price of paper became too expensive, and the Times had to stop printing a physical edition. When I interviewed at the Times, almost one year ago, my now-editor David Boddiger was writing a business plan to keep the paper solvent. Years of financial woes had battered the business, and now it was do or die. But every newspaper in the world faces an uncertain future, and Dave decided to give me a chance: I started sending him articles, photos and video that very week. To date, I have published 74 items in The Tico Times. Tomorrow, the “new” Tico Times will go live on the Internet. I am so excited about this event that there is a permanent fireworks display exploding in my head. In many ways, the paper will remain the same—the same award-winning coverage, the same good-humored style, the same commitment to Costa Rican life and culture. But the paper will no longer look like your hometown Penny Saver. It will look (in my estimation) more like National Geographic. My part in the redesign has been pretty modest (compared with the herculean efforts of the editors, designers, technicians, etc. ), but never, in the course of my long freelance career, have I felt so involved in a publication’s future. I have described my role at the Times as a “dream job” to friends back home, but it is more than that. You can have a dream job at a company you care nothing about. The Tico Times has been my portal to an entirely new nation, language, and way of life. My colleagues are among the most interesting and polymathic people I’ve ever met. I could not imagine a more exciting time to join a company. So whether or not you live in Costa Rica, or you even plan to vacation in Costa Rica some distant day, please visit the new Tico Times website. After 11 months of blood, sweat, and guaro, the old rag is about to look spectacular. I am terribly biased, but believe me, you’ll like what you see. 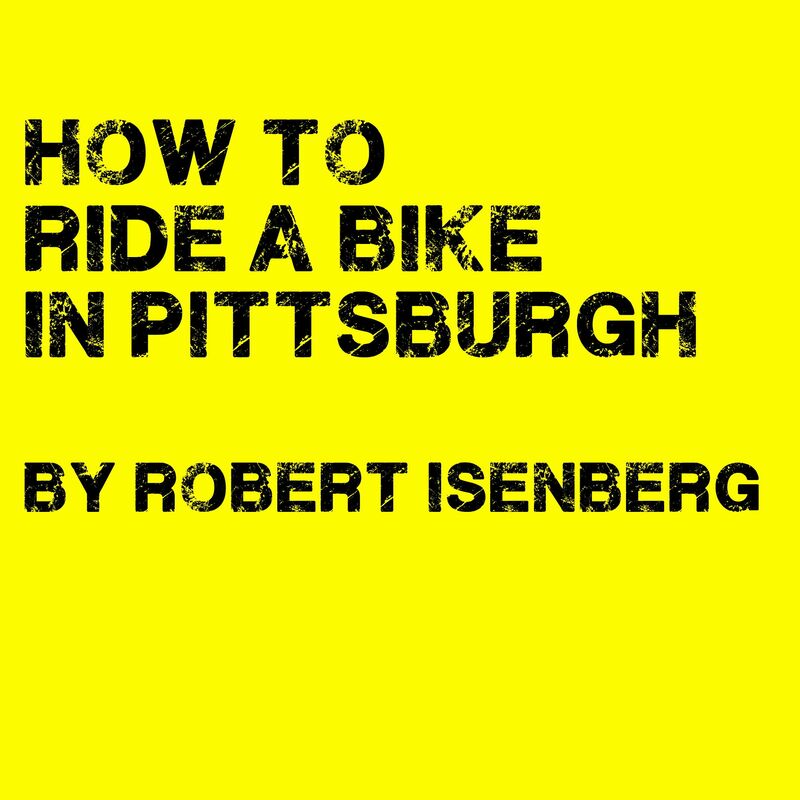 A few years ago, I wrote a chapbook called How to Ride a Bike in Pittsburgh. It was a kind of beatnik memoir of my days without a car, pedaling my bicycle around the Steel City. The concept is based on “how to” guides, but the writing is frenetic and free. This week, that chapbook is available for the first time as an audiobook and ebook. I never expected anything to come of HTRABIPgh. I wrote it for fun, incorporating scraps from notebooks and some poetry I had written (some of that verse helped me win the Three Rivers Review Poetry Prize in 2001). I wanted something textured and unpredictable. HTRABIPgh isn’t just about riding a bike—it’s about being 25 years old, broke, free, and overflowing with life. In 2011, my former student Gina Caciolo wrote me from her MFA program in California. She said she was in a literary publishing class, and she had to produce a chapbook. Since HTRABIPgh was only 29 pages, I figured it was perfect. So I sent her the manuscript, Gina loved it, and she put the thing together. The idea sounded weird and gimmicky, but I conceded. Why not, after all? What was I doing with HTRABIPgh? Let her do what she wanted. At least she’d get an A for effort. When the proof copy arrived in the mail, I was stunned. The chapbook look amazing. More importantly, it looked like nothing I had ever seen before. To my surprise, everybody loved it. I sold my 10 complementary copies almost immediately. People wrote me to say how much they enjoyed it, and a few sent pictures of it on their desk or shelf. Later, Gina brought copies to the annual AWP Conference in Chicago, and her supply apparently sold out. Unfortunately, the limited-edition books were hard to make. Time went by, Gina moved to Connecticut and then to Eastern Pennsylvania, and I prepared to move to Costa Rica. We had talked about reviving the project, but short-run literary imprints are hard to commit to. But then something happened: For the past three years, I have been wildly obsessed with audiobooks. I am a diehard Audible fan, and I have listened to no fewer than 40 audiobooks since first subscribing. I have often dreamed of recording audiobooks, partly because I love them, and partly because I might put my theatrical background to good use. My family has a long tradition of reading books aloud (it was my Mom who first read The Hobbit to me, as well as a half-dozen other YA novels), and because I am a slow reader, listening to a book while doing something else is a recipe for a perfect day. As it turns out, Audible now takes open submissions through its ACX program. When I discovered this platform, I was ecstatic. I had known about Amazon’s open-source Kindle program, and I loved the idea of making this tiny book globally available for the first time. Here’s the big news, though: Publishing HTRABIPgh as an ebook and audiobook is only the trial run for a much more significant project: the recording of several books, previously published or never-before-seen, in audiobook format. My goal is to create a kind of Isenberg Library. Friends and colleagues have often suggested that actually reading my books is not nearly as enjoyable as hearing them performed at live engagements. I embrace this fact. As for HTRABIPgh, nothing will ever beat Gina’s original printing. The format is so unique, so beautiful, that I look forward to another edition. Neither audiobook nor ebook could ever compare to those first one-of-a-kind copies. But my hope is that each version offers something different. HTRABIPgh is the shortest volume of the books I hope to revive, but it is also the most dynamic. If you can track down a copy of the original chapbook, I urge you to do so. As a piece of visual art, Gina’s work is bar none. So stay tuned. If you like HTRABIPgh, there’s a lot more coming up.